JOHN D. LYSTON, CIVIL WAR VETERAN, IS DEAD. Employed by the Metropolitan Life Insurance Company For 24 Years. John D. Lyston, aged 76 years, a veteran of the Civil War and a well known local resident died Saturday evening about 10:30 o'clock at his home, 100 Franklin street, Rutland, Vt,following an illness of about two weeks. 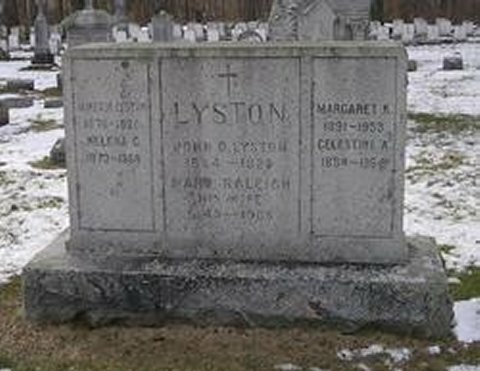 Mr. Lyston was born in Center Rutland, Vt. July 23, 1844, and had lived here all his life. He received his education in the local schools. At the age of18, during the Civil war, he enlisted in Company K of the 12th Vermont regiment. He was employed by the Metropolitan Life Insurance company for the past 24 years. Mr. Lyston was a member of St. Peter's church, of Roberts post, No. 14, GAR, and Rutland council, No. 232, Knights of Columbus and the Holy Name society. He is survived by five daughters, Miss Irene Lyston of Brattleboro, Vt., Mrs. Peter E. Poulette, Misses Ella, Margaret and Celestine Lyston of the city,(Rutland) two sons, John P. Lyston of Norwich, Conn., and Frank R. Lyston of Albany, NY and ( ?) Barbara Poulette of this city. Members of Roberts post, No. 14, GAR, will meet at the house this afternoon at 2:30 o'clock,when the GAR ritual will be carried out. Funeral services will be held tomorrow morning at 9 o'clock at St. Peter's curch and burial will be in Calvary cemetery. Military Record: LYSTON, JOHN D., Rutland, age 18, enlisted 8/19/61, mustered in as private, Co. K, 12th Vermont Infantry 10/4/1862, mustered out 7/14/1863. Source: Rutland, Herald, Oct. 18, 1920.